Don’t you want to be a leader that employees admire and respect? What if, without even realizing it, you’re making mistakes that are causing you to be a bad boss? Here are 13 signs that you might be a bad boss. 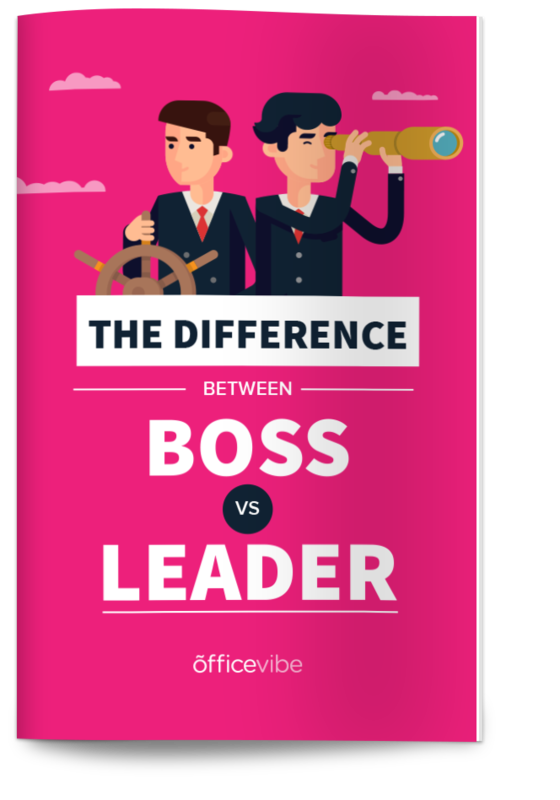 Download this right now: This guide on the difference between a boss and a leader will show you exactly how to be a good leader. This infographic was crafted with love by Officevibe, the software that helps you become a better leader through frequent and honest employee feedback. I get that you’re busy, but employees need a ton of guidance to make sure they’re on the right path. They’re also nervous about pleasing and impressing you, making your guidance even more important. Establishing clear goals and reviewing them regularly is a great way to ensure that employees get the guidance they need. Be strict about doing checkins with your team each week. The point is to make it super clear to employees what they need to do, and that they shouldn’t be scared to come ask you for help. Coaching and development should be an ongoing thing with your team. There’s no reason for you to skip a meeting like this with an employee, it’s actually incredibly insulting to an employee if you do that. It might take a bit of time off of your schedule, but you’ll be able to uncover issues, help them with their work, and make sure they have everything they need to be productive. Make it a rule to never skip a performance review meeting with an employee, including one-on-one meetings. Some people genuinely enjoy the drama and playing politics, but this isn’t an episode of House of Cards, this is real life. Don’t waste your time playing politics, instead, help your employees be the best they can be. When they perform better, you’ll look better, so it’s actually in your best interest to make sure they’re doing well. If you’re a true leader, you’ll give all the credit, even if you truly deserve it. Remember, your job is to act like a coach, you want to make them the stars. Give them the credit and make them feel good about their work. That feeling of happiness and pride will carry over into future work down the road. Your employees will be more likely to want to do good work for you to chase that “high” that they got last time when they got the credit. Give employees the recognition they deserve. It’s all chemical, and is an easy way to get your employees to continuously do good work. If your department is a revolving door then there’s a huge problem that you need to address. Unfortunately, the problem is likely you. This is why it’s so important to collect honest, frequent feedback from your employees. They’ll be able to tell you about the problems they’re having before it’s too late. Turnover is expensive, both financially and emotionally. You want to do everything you can to avoid voluntary turnover. This is a big issue, because blame gets you nowhere and hurts or embarrasses an employee. There’s absolutely no point in blaming anyone for any mistake. A better idea is to move on, and come up with a way to not let this happen again. It’s understandable that in the heat of the moment you want to know who did it, but you need to think about how useless of an exercise it is. Instead of causing harm to an employee, let everyone know that mistakes are okay, everyone makes them, and we can all learn from them. You want to do everything you can to remove the fear that employees have. This one is the worst mistake to make. Everyone hates it, and surprisingly, so many managers still do it. It’s because many people have a hard time giving up control and giving employees autonomy over tasks, but people need autonomy to feel a sense of pride at work. Without it, they feel useless and like there’s no point in trying, since you’re going to be doing all the work anyways. You want to still keep your team accountable, but do it in such a way where it’s more like you’re offering help is they need it but they still have ultimate control. This is one of the easiest ways to demotivate your employees. Employees are smart enough to notice when you’re playing favorites, and it’s not fair to anyone on the team. While it might be nice to the ones you’re playing favorites to, the employees that aren’t treated fairly will quickly become disengaged and dislike you for doing that. What you want to do instead, is treat everyone like equals and create a culture where everyone is on the same level. A culture that is inclusive will help you build the kind of company that employees truly love. The more your employees know, the better they’ll be at making decisions that will positively affect your organization, so what’s the point of hiding information? More and more companies are starting to practice radical transparency, where companies will share everything they’re legally allowed to share with their team. This is a smart practice, because transparency breeds trust, and trust is what you really want at the end of the day. Most likely, in the long run you’ll just lead to employee burnout. What you want instead, is to give employees a good work-life balance. Working overtime doesn’t work, the research is very clear on this. After a certain amount of time, you just stop being productive, and start making all kinds of mistakes. Most of the time, your work needs to be rechecked or redone anyways, so there’s no point in forcing or even expecting employees to work longer hours. As a leader, you should set a good example for your team and have a good work-life balance for yourself. Giving employees recognition is one of the easiest and least expensive ways to get your team engaged. I’m not sure why some managers are so bad at giving recognition, it’s such a simple thing to do. All you have to say is “thank you, great job!”. It takes literally 10 seconds and can make a huge difference in the mood of an employee. Employees need recognition at a minimum of once per week, but feel free to do it more often. A good team culture is all about respect. If you don’t respect your employees, they won’t respect you, they won’t work hard for you, and everyone will suffer. If you have this attitude like everyone is beneath you, you’ll lose a ton of respect. What you want to do instead, is build a culture where every everyone on the team feels equal. You’re all working together in unison to drive the company forward. It’s natural to get defensive when someone gives us feedback, but it’s not the way to be as a leader. As a leader, you want to continuously grow and get better for your team. You need to understand the concept of servant leadership and realize that your job is to serve your team, doing whatever you can to make sure they’re the best they can be. Learn how to accept feedback as constructive, and only meant to help you be a better leader for your team. What Are Some Other Signs Of A Bad Boss?